Situated between China and Russia, Mongolia is a rare and exotic travel destination with a long and fascinating history. 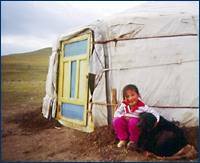 The ancient lifestyle and traditions of Mongolia's people have prevailed through great political change. Accustomed to hardship, Mongolians exude a patience and tolerance seldom seen in the western world. Mongolia possesses one of the few remaining expanses of truly untamed wilderness. When galloping on horseback across the wide-open steppe where nomadic herders tend their animals on seas of emerald green grass, it is easy to imagine you are in the Mongolia of Genghis Khan, eight centuries ago. Cabaret Diosa Treks & Expeditions invites you to join us for the experience of a lifetime as we share the unique culture and natural beauty of Mongolia. Our trips appeal to those who not only want to see the scenery, but also feel and be an active part of this amazing country. Have a cup of tea with the monks of a remote Buddhist monastery, race a camel in the Gobi, travel by jeep through territory where few roads exist, trek and climb in an undiscovered corner of the world. Active adventure is important to us - being part of the scene, breathing the air, meeting the people and taking every opportunity to participate in the unexpected happenings along the way. Our Mongolia Panorama tour coincides with the spectacular Naadam Festival in Ulaan Baatar in July, while our climb of Mt. Khuiten coincides with the colorful and unique Kazakh Naadam in western Mongolia. We customize itineraries to suit your schedule and special areas of interest.